Our Church whole heartedly believes that apologetics plays a vital role in the effectiveness of being steadfast, faithful Christians. By providing answers, we can effectively bring people to Christ. We believe scripture brings clarity to our faith. Our theme is found in 1 Peter 3:15 where it says "be ready always to give an answer to every man that asketh you a reason of the hope that is in you with meekness and fear." In an age of skepticism and questioning of our faith it is of utmost importance that we clearly articulate what we believe and why. That is why we host an annual event called the "Defend Your Faith Seminar". Each year we address subjects that we feel are pertinent to the world we live in. This event is always open for anyone to attend. We pray it becomes a source of strength and encouragement as we seek to glorify our Savior with truth and love. 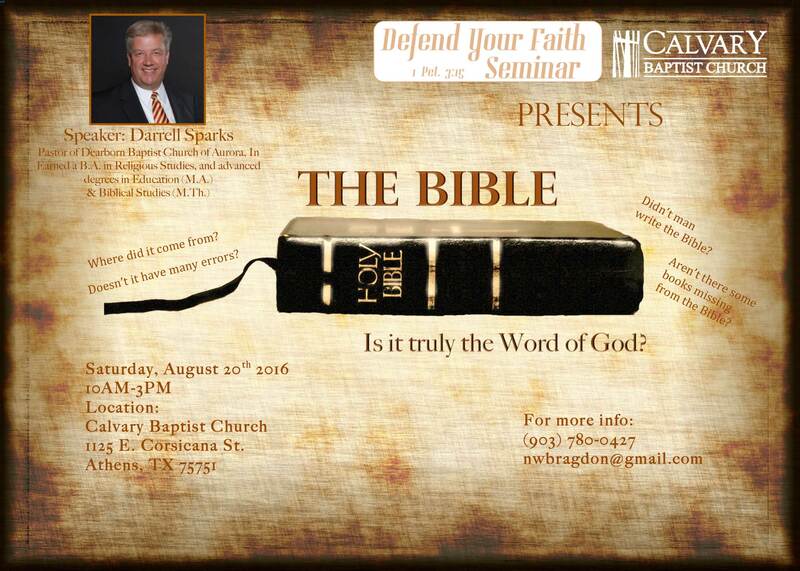 Defend Your Faith Seminar 2016 - "Is the Bible truly God's Word?""